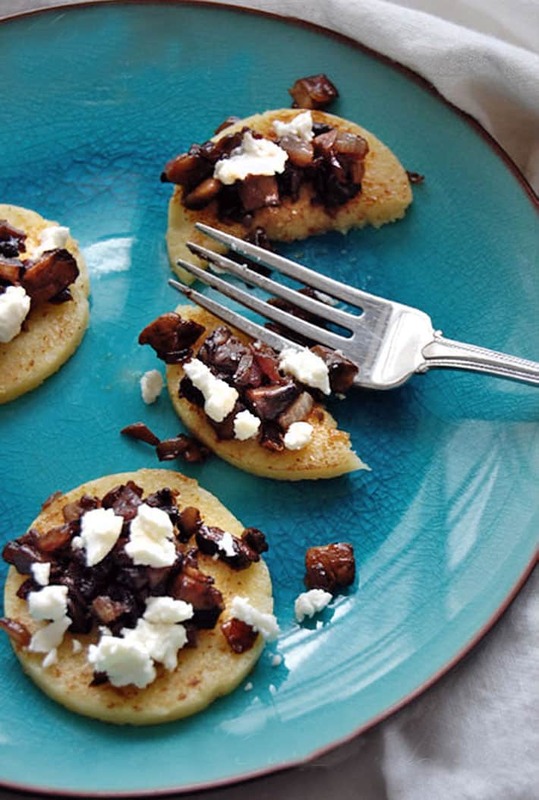 Polenta rounds w/ Portobello Mushrooms. You’re about to develop an addiction. I felt it only fair to warn you. 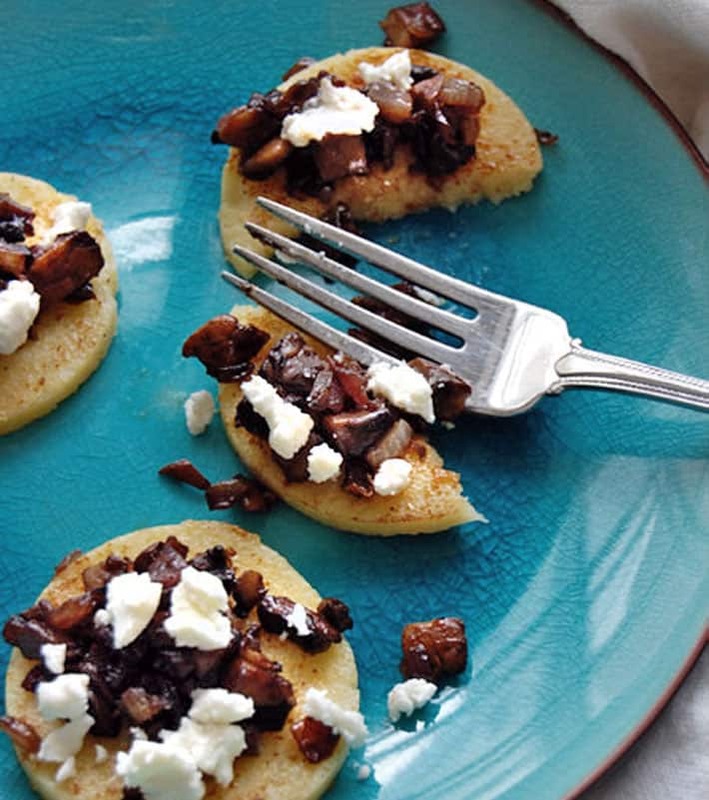 Seared, polenta rounds with softened mushrooms and onions topped with a shot of balsamic and creamy goat’s cheese. A fast and easy sidedish or appetizer. Here’s the thing about side dishes and appetizers. They should be easy. Why? Because I say so. My theory pretty much ends there. I think it’s a good one though. This quick polenta dish is perfect for either an appetizer or an easy side dish. 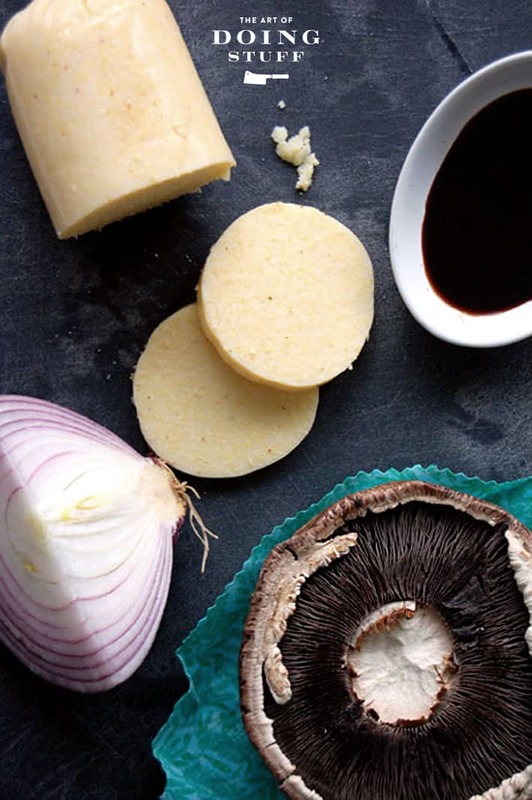 All you need is a tube of polenta (doesn’t that sound appetizing), 2 Portobello mushrooms, 1 red onion, balsamic vinegar and some goat’s cheese. Don’t really like mushrooms? What’s wrong with you? I genuinely HATE mushrooms. If you’re going to dislike something you should fully commit to it. But for some reason I love this easy side dish (or appetizer), mushrooms and all. There’s something wrong with one of me. I can be difficult. Unlike this appetizer. Dice your onion and cleaned mushroom. Cook onions then mushrooms. Add a splash of balsamic at the end. 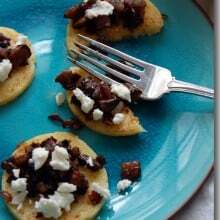 Serve on warmed, pan fried polenta and top with goat’s cheese. 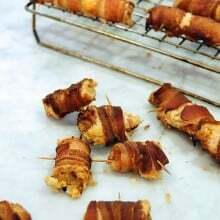 These can be served either as an appetizer or a side dish. The especially great thing is you can pre-make the topping, stick it in the fridge and use it all week long. Just heat it up, dollop it on some pan fried polenta rounds and top with goat cheese. 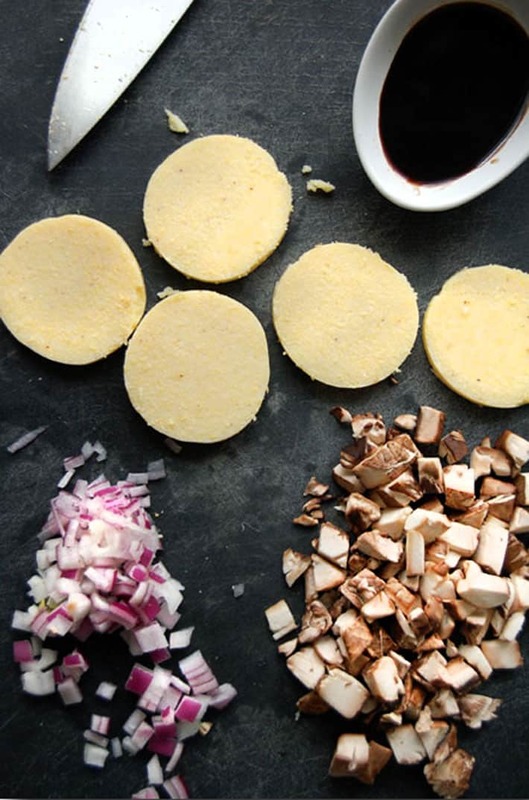 Slice polenta into generous 1/4 inch thick pieces. Clean mushrooms and remove gills. Cut into a small dice. Dice an equal amount of red onion. Cook red onion in non stick pan over medium heat until soft and translucent. Turn heat up to high and add mushrooms. Add in a big glug of balsamic vinegar. You aren't making a sauce here, you're just making a glaze. 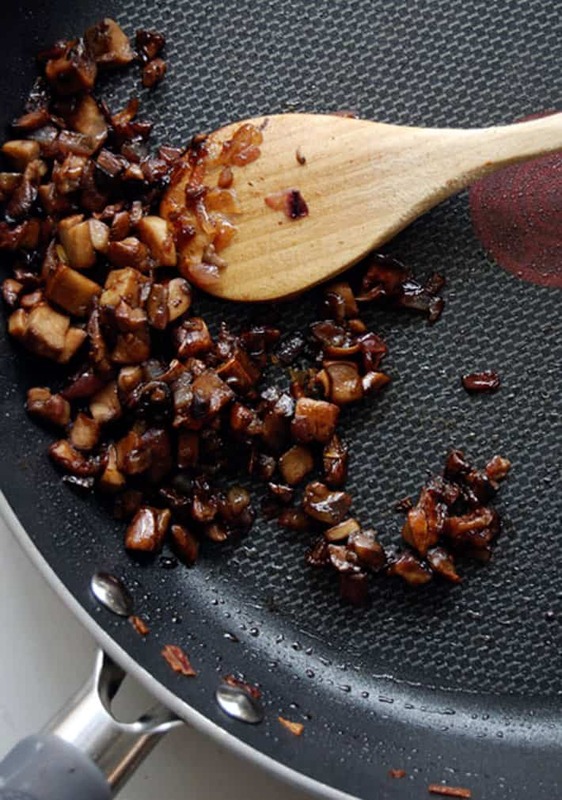 Your mushrooms and onions will instantly caramelize from the high heat of the pan. Remove the pan from the heat when most (but not all) of the balsamic is gone. Remove mushrooms and onions to a bowl and cover with tin foil or a dish towel to keep warm. 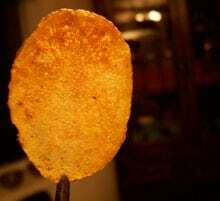 Turn pan heat down to medium and fry polenta rounds until golden on both sides. You absolutely have to use a non stick pan or you'll regret it. Spoon mushroom and onion mixture over warm polenta rounds. Top with crumbled goat's cheese. Broil if desired. For some reason a lot of people think food needs to be difficult to taste good. It doesn’t. Honey. Honey isn’t difficult. And it’s delicious. Fair warning on the fact that tomorrow my theory may change entirely. I might decide only difficult things are worth eating. Things with 72 ingredients including things like double charged avocado foam and Sparrows feet. Like I say. Unlike this appetizer, I can be difficult. 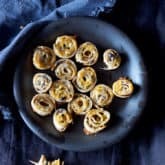 PINWHEEL APPETIZERS WITH OLIVES AND CHEESE. Thanks Karen…it sounds delicious! I’ve not had polenta before but I love the other stuff, especially portabellos. As soon as I find a tube of polenta somewhere I think this will be my dinner one night ! Now I have to go google what polenta is…thanks for the extra homework! One essential step remains, put under the broiler to cook the polenta and melt the cheese! or, if you cook everything in an oven proof skillet, you could just transfer the pan to the oven to melt the cheese super fast. Not being all that experienced with polenta, I thought it was usually fried. So i might try frying the rounds first. And NO mushrooms, maybe chopped tomatoes. Maybe drizzle with olive oil and then put the cheese on? Beginning to sound like bruschetta. Oh well, I tried. Thanks for a great blog Karen. It’s my first stop in the morning! my mouth is watering at the thought of it. thanks much for this one! Awesome! I am known for a similar summer appetizer, but I use the fresh mozzarella in the tube, then dice up tomatoes, little basil, maybe feta and drizzle with olive oil and balsamic glaze. No cooking required. But I’m having people over for dinner tonight, thank you for this idea! OOh! Ooh! This sounds delightful! I don’t like mushrooms, either, but I think this would do the trick anyway! What aisle will I find the polenta in? Patti – Either in the “international aisle”, or with the pasta, or the cornmeal. ~ karen! Karen, I’m a little creeped out — yet strangely thrilled — that you’re sneaking into my house to check out my fridge and then writing recipes around the contents. Doing the vegan thing for a while (kinda think it won’t be for a looooong while though) missin me some CHEESE! OK..I hate to bring this up but you hate mushrooms but you love this recipe..but then you hate Brussels sprouts but refuse to try any recipe for them..You are difficult again aren’t you..LOL..Now that I said that..Please forgive me if you get a zillion recipes for Brussels sprouts again..Also..This looks so good and I love mushrooms..raw or cooked..
I’m glad that you replied to Barbie because, like her, I was confused. i thought you wrote HATE but meant LOVE mushrooms. I only bought a tube of polenta once, but never knew what to do with it. This creation sounds easy and delicious because I LOVE red onion, mushrooms (especially Portobello) and feta cheese. I’ll get some polenta and give it a try. Thanks for the great idea Karen. Love easy apps. Thanks for this one to add to my arsenal! 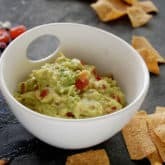 I’m super excited that you shared this recipe!!! Did I ask you to give us a polenta recipe or was that my imagination? No! Actually, all I ever see is creamy polenta recipes – or actually, the “recipe” is never more than “make polenta. top with your favorite sauce.” that’s not a recipe. I wanted to know how to do the solid polenta! And now you’ve shown me how! Yay! thanks Karen! I rather like goat cheese. I’m good with the onions. But I never found polenta to be that interesting. Particularly the stuff sold in tubes in grocery store deli sections. Are you a fan of this very bland starch or does the mushroom-goat cheese-onion combo work magic on it, too? Marti – I actually love polenta, but I also love pretty much any cornmeal product. ~ karen! Fried cornmeal, baked cornmeal, grilled cornmeal, barbequed cornmeal, corn bread, corn chips…that, that’s about it. I would have done this backwards. I would broil cremi mushrooms and used the cavity to hold the polenta and other ingredients. Made these tonight. LOVED LOVED them…soooo easy. Didn’t use the cheese which of course would have made them just over the top….but…..had to stay true to the diet at least for now! I used a little marinara, but they were still awesome. Thx karen. I’m a vegetarian and this happens to be one of my all time favorites. I also like to do layered, roasted portobello. Slice polenta log into disks. Drizzle olive oil onto upturned mushroom after cleaning it. Salt and pepper, herbs of your choice. Put polenta disk on top of shroom, followed by a layer of freshly sliced tomatoes and any meltable cheese you like. Drizzle olive oil over all, little more salt, maybe chili flakes, more herbs. Roast in oven on 400 for about ten minutes. Amazing! Super easy and ridiculously fast. Great side. Add a Boca burger to the layer and you have an instant entree. Serve with broccoli or Brussels Sprouts and wash it all down with a vanilla oatmeal stout. Jackson – I’m there with you on everything! Except the brussels sprouts. 😉 ~karen! Did you find the polenta and make it today or are have you made it before? I absolutely love it and I’m not a huge mushroom fan. ~ k! Oh good! I’m glad you liked them. I’m just going to the grocery store now to get my groceries so I’d better decide what it is (other than anojitos) I’m going to have! ~ k!